A couple months ago at a holiday party we were introduced to the Mushroom guys from Back to the Roots, Alejandro Velez & Nikhil Arora. These two guys are affecting the food world in radical ways by selling home grown mushroom kits. One of the many great things about these kits is that they are made out of a resource that would otherwise be waste, used Peets’ Coffee grounds. These guys are recycling a material that Peets’ Coffee paid a waste disposal company to haul to the landfill. The spent coffee grounds are sterilized inoculated with oyster mushroom spoors and packaged in recycled paper. 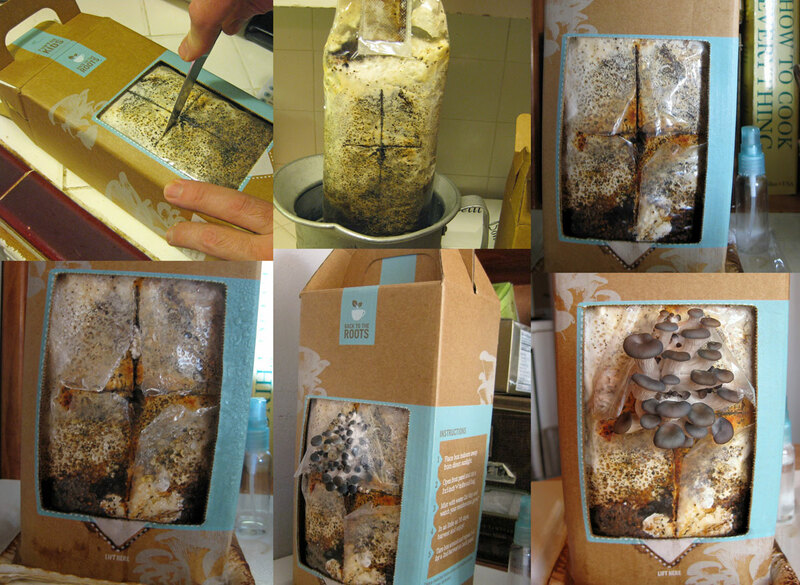 Home growers grow the mushrooms in the packaging and then compost the remainder when all is done. Growing mushrooms just takes water and time. Perhaps a little of the coffee has seeped into the mushrooms because these guys are extremely pumped about their product, and they should be. The guys have been featured Ted talk speakers, and the mushroom kits are this year’s unique and creative Valentine’s gift by the Huffington Post. 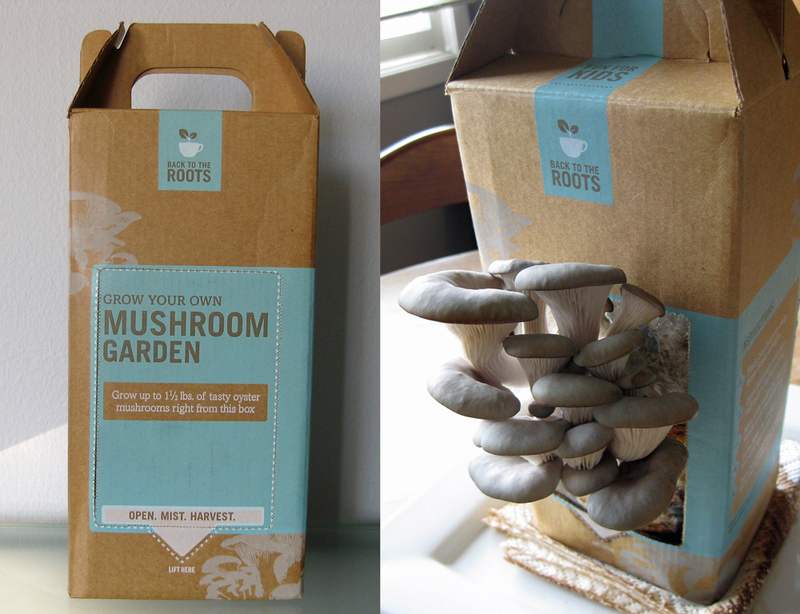 We were delighted to find the mushroom growing kits at Rainbow Grocery in San Francisco, and learned from the guys that the kits are also available at a variety of Whole Foods throughout the U.S. They will happily send a kit out to the teacher of your choosing if you post a picture of your kit, showing a cluster of growing mushrooms, on their Facebook page. How cool is that? With our kit, we managed to grow a beautiful cluster of delicious mushrooms in just a couple of weeks. We’re now working on “side two” and hope to have a second crop soon. Growing mushrooms at home may seem like a novelty, but we take a lot of satisfaction in knowing we had a hand in growing the food on our table, however light the touch. Your kids (or the inner kid in all of us) will have a blast with this food growing “experiment” and we’re willing to bet they’ll love eating the results too. At the very least, they’ll come away from it with a better sense of how food comes to the table. Once the fungi have fully matured there are so many great recipes to use them in. Our choice is to make it as simple as possible. An easy, but not-so-quick, mushroom and eggs. Preheat oven to 150 degrees. In a medium non-stick skillet, over medium heat add the shredded mushrooms and toss in pan. Dry fry the mushroom until slightly browned about 5 minutes, add the thyme and fry for about 20-30 seconds or until the thyme is fragrant place in a small bowl, and set aside in the oven to keep warm. In the same skillet used to dry fry the mushrooms, heat the butter until it has melted or the olive oil until it is just hot. The pan should be maintained at a very low heat. Crack open the eggs and add them to a medium-sized bowl. Add a pinch of salt and a few grinds of pepper. Beat with a silicon whisk. Add the eggs to the skillet and continue to beat with the whisk over very low heat. As you cook and whisk the eggs, pay close attention to the curds. If you notice curds forming, take the pan off the heat and whisk furiously. This process is a labor of love; the longer you cook them over very low heat whisking them the better they are. Cook for 15-30 minutes. A small, soft curd of eggs is the texture you are looking for. Place the toasted bread on each plate, add the soft scrambled eggs, and top with the oyster mushrooms. Scatter the chopped chives on top of the mushrooms and serve. That looks delicious, that’s definitely what I’m doing with my next crop! Thank you, Emily! We love this dish. Soft scrambled eggs are a staple in our house. These mushrooms are the perfect topper. These are so cool! I love how they mixed good design, a great idea, and a little fun all togther to make a great product. It says on their site that some kits can get up to 4 crops! Good luck! Thanks for commenting, GGF! We’re having a lot of fun with this growing experiment and look forward to lots more homegrown mushrooms. All the best to you on your efforts and on your blog. We’ll be sure to add you to our blog roll. Our gluten free friends will welcome the resource. Thank you, Christina! Go out and get yourself a mushroom kit (a nice Valentine’s Day gift to yourself) and have fun. Your blog is terrific and the photography is great. We’ll be sure to stop by often. Love back to the roots! Jill, we were blown away by these guys when we met them back in December! They’re smart, they’re committed and they seem to be having the time of their lives with this venture. We couldn’t be more excited to spread the word.